Children's Helpers Worldwide | Children go back to school in China, Ghana and Romania! Children go back to school in China, Ghana and Romania! 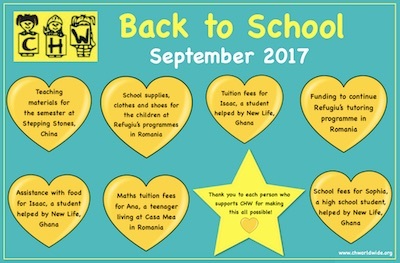 In September, the new school year started in three of the countries where CHW supports projects (China, Ghana and Romania), so it has been a busy time for the children and young people in those places! A huge thank you to each of CHW’s supporters who made it possible to run programmes for disadvantaged children this term, and who helped individual children and young people to continue with their education! You are making a big difference in their lives. – Provide teaching materials for Stepping Stones’ educational programmes for migrant children in China for the semester. – Sponsor Refugiu’s tutoring programme for disadvantaged Roma children in Romania. – Give school supplies, clothes and shoes to the children at Refugiu’s programmes in Romania, in time for the new school year. – Provide a scholarship for Isaac, a Ghanaian student, who grew up at New Life’s children’s home, to study Mechanical Engineering. With thanks to the company, Ronco Cayman, for this sponsorship. – Provide Isaac, the Ghanaian student, with a stipend for food. – Sponsor the school fees for Sophia, a high school student, helped by New Life, Ghana. – Provide the fees for extra maths tuition for Ana, who lives at the children’s home, Casa Mea, in Romania. You can see more about these projects, and the supporters who made it all possible, in our latest newsletter, here. Thank you for helping these children and young people!